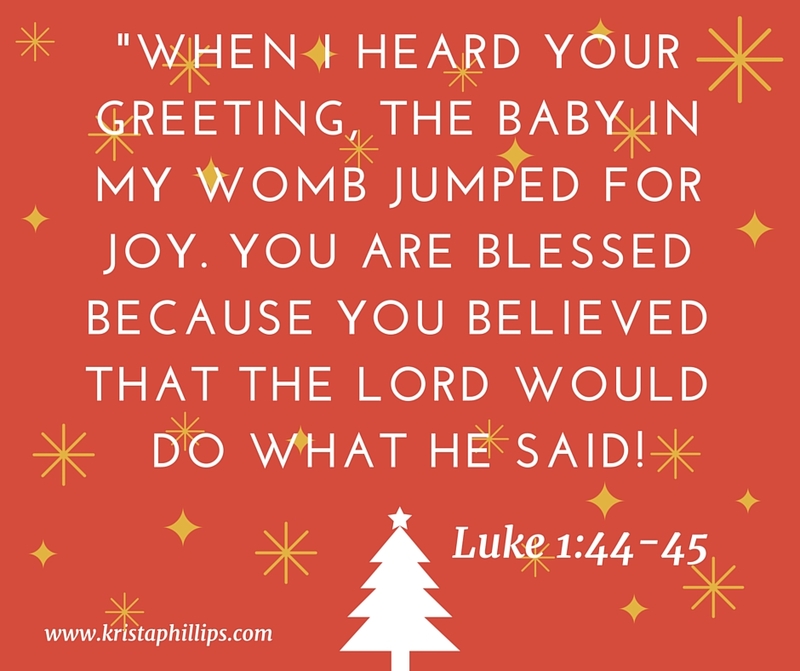 I’m reading through the various versions of the Christmas story and events surrounding it in my (should be but not always) daily Bible reading. I found this one today and am pondering it. We talk about the word BELIEVE a lot at Christmas time. I’ve always thought of it as the tie in to Santa — that kids BELIEVE (or not) in Santa. But I think when I see the world BELIEVE in Christmas decorations now, I’m going to think of this verse. To how Mary believed the impossible — that she, a virgin, was carrying a baby from God. That she BELIEVED even though this pregnancy could cost her her life. That she BELIEVED that God would do what he said he would– even though His words definitely didn’t match up to how she thought her life would go. What promises are YOU believing today? A promise in your life that seems impossible but you are believing anyway? Be careful — for ME, I find it really easy to confuse God’s promises with my own desires. I’ve begged and begged God to have a no sickie Christmas this year. And what happens this week? Strep happens. Annabelle had a fever all weekend, Gabby came down with it on Monday and Scott on Tuesday. Thus far the other 3 of us are sickie free, and I’m praying and begging God to keep it away from us. For the girls to get through their final exams this week without getting sick. And for us not to have ANY sickness on Christmas. But — God never promises me an illness free Christmas. I learned 5 years ago, that he doesn’t even promise us “first Christmas at home” with our baby. He does promise to be with us every step of the way, though. And He does hear our prayers and I’m hopeful that we WILL be all well next week. Ah, such a hard thing sometimes, to distinguish between our own wants and desires and God’s promises.